USA Today is reporting that Washington Nationals outfielder Jayson Werth could face jail time after being pulled over on July 6 in Fairfax County, Virginia for driving 105 mph in a 50 mph zone. Some quick research I did on baseball-reference.com shows that the Nats played the Cubs that afternoon in D.C., so he was probably hurrying to the ballpark for the 1:35 pm game, which I guess shows some admirable hustle. Interestingly enough, though, Virginia has some of the strictest traffic laws around, and reckless driving offenses in that state can lead to jail time. 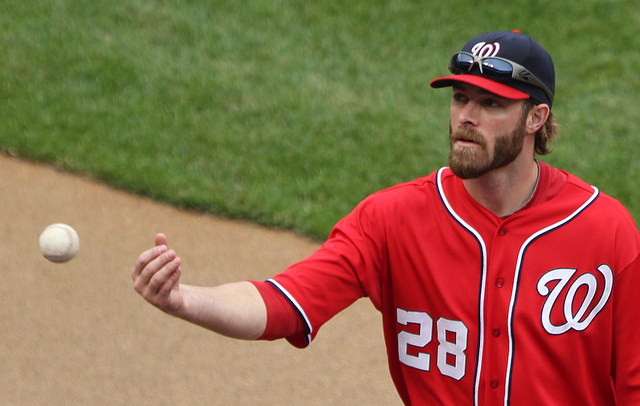 That looming possibility may explain why Werth moved his court date from August 8 to November 12, which would be after the conclusion of the World Series, which the division-leading Nationals have hopes of competing in. More often than not, though, the arrest of a celebrity ends in a simple fine or some kind of fairly easy community service sentence. So don’t be surprised if Werth shows up in a court-mandated PSA in which he tells young drivers to “hit a home run by following the speed limit,” while maybe throwing in “just say ‘no’ to drugs” and “loose lips sink ships” for good measure. During the offseason, Los Angeles Dodgers all-star outfielder Yasiel Puig was caught on a dashboard camera being arrested in hot pink jorts for driving his white Mercedes 110 mph in a 70 mph zone on I-75 in Florida. In 2012, Cincinnati Reds closer Aroldis Chapman made the news for driving his black Mercedes 93 mph on I-71 North towards Columbus, Ohio, with a suspended driver’s license. To Chapman’s credit, though, he is the only one of these players who can throw faster than he drives.